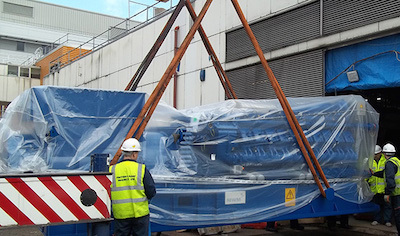 Vital Energi have delivered five Combined Heat and Power (CHP) engines to five hospitals in five days and when combined with energy efficiency measures they will result in estimated financial savings of £44.6 million over the course of their life cycles. In addition to the financial benefits, the new systems will have an enormously positive environmental impact and are estimated to reduce harmful CO2 emissions by over 200,000 tonnes during their life cycles, which is the equivalent of taking 40,000 cars off the road for a year. Ian Whitelock, Joint Managing Director of Vital Energi commented, “Delivering five engines in five days is a huge undertaking. Normally the lead time on an engine would be in the region of 26 weeks and in some instances, to meet our clients’ funding deadlines, we reduced this time to 6 weeks. Due to the nature of funding in the NHS, it is often imperative to move quickly and at Vital Energi we have structured our organisation, and our supply chain, to be able to meet these challenges. Three of these Trusts; York, Northampton and Gloucestershire, have entered into long-term Energy Performance Contracts with Vital Energi, who have guaranteed their financial savings and carbon reduction figures over the course of the projects’ life cycles which range between 15 and 18 years. When fully operational, the 5 engines will represent over 6.8MWe output.